Drawn by the growing mining-industry cluster, Canadian-based Symboticware will open its regional U.S. headquarters in Tucson next week. Based in Sudbury, Ontario, Symboticware specializes in real-time software for production and maintenance to support underground and open pit mines. Symboticware recently signed a contract with a Nevada mine operation which will support the first two of 20 employees at its Tucson office. The company’s software helps mine operators monitor everything from tire pressure and speed control on mining trucks to environmental compliance. Read more. In 1994, a group of engineers decided to try the entrepreneurial life and established Phoenix Analysis & Design Technologies, Inc. (PADT). After two-and-a-half decades, the company has grown from those humble beginnings to employ over 95 people located across six states. The original vision of PADT’s co-founders was to take the advanced computer-aided engineering tools that were changing how turbine engines were designed and apply them to other industries. These tools, known as numerical simulation, comprehensive product development, and 3D printing, became the foundation of PADT’s business, and have only increased in sophistication and use. “When people ask us how we have thrived for so long, we point to our employees,” said Eric Miller, co-founder of PADT. “PADT is a place where smart people like to come to work, largely because they get to take on challenging tasks for appreciative customers. The past 25 years have been an amazing journey, and the next 25 are full of potential.” Read more here. Benchmark Electronics, Inc. announced that its Board of Directors has appointed Jeff Benck, 53, as President and CEO. Benck is a seasoned leader with over 30 years of experience in the technology sector. He most recently served as President and CEO of Lantronix, a global provider of secure data access and management solutions for industrial IoT, where he drove significant growth through a focus on operational execution and product innovation. Under his leadership, the company’s profitability more than doubled and market capitalization more than tripled, delivering significant shareholder value. Read more here. 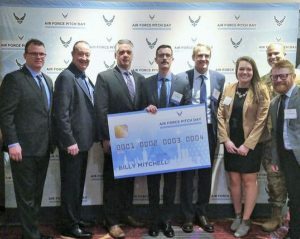 During its inaugural Pitch Day event, the U.S. Air Force awarded 51 contracts totaling nearly $9M in a matter of minutes. Delta Development’s Pitch Day idea was selected from 417 submissions reviewed to make an in-person presentation. After giving a five-minute pitch, Delta Development was awarded a $158K contract to develop a refrigeration product designed to help bring fresh whole blood further forward on the battlefield—saving time and lives. Read more here. 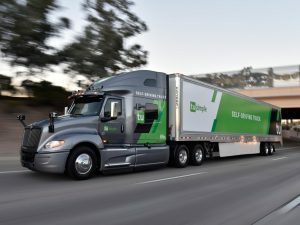 TuSimple, founded in 2015, recently announced that, by June 2019, it will expand its fleet from 12 to 40 autonomous trucks on the road. That will make it the largest self-driving truck solutions company in the world. So how is this little-known autonomous trucking company is beating Tesla and Waymo in the race for driverless big rigs? Technology created by TuSimple relies on a minimum of nine cameras, five radars and two laser radars to read the road. Trucking executives see the autonomous feature as a way to cut labor costs. According to a Morgan Stanley report, the labor savings from implementing driverless trucks would save the industry $70 billion per year. Productivity would be up 30 percent because driverless trucks would run 24/7. The company’s goal is to increase safety, decrease transportation costs and reduce carbon emissions—all while transforming the way packages are shipped. According to a Morgan Stanley report, the labor savings from implementing driverless trucks would save the industry $70 billion per year. Watch the video here. In her work as an optical design engineer at Edmund Optics, Katie Schwertz focuses on light and how we see it. 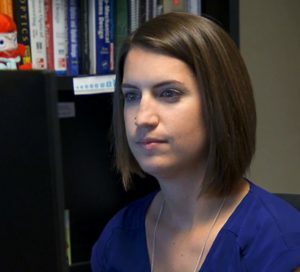 In a recent interview with NBC News, Schwertz shares her passion for optics, how optics makes our lives easier, and how engineering moves society forward. So what is optical engineering? Tucson-based Edmund Optics, the world’s largest supplier of optical components, offers thousands of unique optical components including optics, optomechanics, imaging lenses, microscopy components, cameras, lasers, test targets, as well as custom solutions. “Engineering moves society forward,” added Schwertz. “The things that you use, the things that you rely on, the new technology that comes out, that all relies on different fields of engineering. It’s really cool to see something that you’ve created or something you’ve worked on that is then used out in the real world. That’s what I love about engineering.” Watch the interview here. A Leader in treatment service technology, iTether Technologies was named as one of 10 first-round winners of Addressing Opioid Use Disorder in Pregnant Women and New Moms, a Grand Challenge created by The Health Resources and Services Administration’s (HRSA) Maternal and Child Health Bureau (MCHB). The winning innovations are technology-based solutions to improve access to quality health care for pregnant and new mothers struggling with opioid use disorder. The innovations aim to reduce barriers in obtaining safe and effective care and treatment, especially for families in rural and geographically isolated areas. 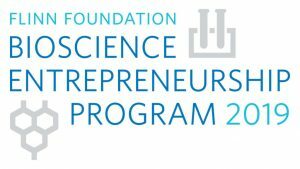 Phase 1 winners receive a share of a $100,000 cash prize and continue to Phase 2, where they will develop their prototype and begin small-scale testing through August 2019. Read more here. 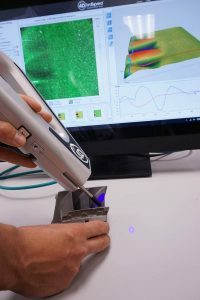 4D Technology Corporation’s handheld 4D InSpec® XL defect inspection gauge has received the 2019 PRISM Award in test and measurement. Judging entries from around the world, thirty-three jurors selected “products that make a difference, solve problems, and improve life through photonics,” according to the awards’ committee. The award was given to the 4D InSpec XL for its utility and importance in making instant, qualifying, 3D measurements of surface features on manufactured parts being evaluated for use, rework, or scrap. Released to the market in 2018, 4D InSpec XL is currently being adopted in critical parts manufacturing and rework sectors such as aerospace, aviation and automotive manufacturing. The device provides instant qualification determination, measuring depth and height of features, radius of curvature, and verifying textures that are necessary to part acceptance. Read more here. In addition to $30,000 in funding administered through a nonprofit partner, the entrepreneurship program provides each competitively selected firm a bundle of benefits, including a professionally developed, yearlong plan specific to the needs of the company, helping them to navigate the challenges facing startups and empowering them to become investor-ready. Read more here. Researchers at Arizona State University, in partnership with collaborators at The University of Texas at Austin and Northern Arizona University, have announced $1.5 million in funding from the U.S. Department of Energy’s Advanced Research Projects Agency-Energy (ARPA-E). The research team will demonstrate an entirely new direct air capture (DAC) concept using novel materials to collect low-pressure carbon dioxide from ambient air. The project is a collaboration between researchers from the Ira A. Fulton Schools of Engineering and Biodesign Institute at ASU; the College of Engineering, Informatics, and Applied Sciences at NAU; and the Cockrell School of Engineering at UT Austin. The results of the team’s carbon capturing technology will have the potential to help thwart the effects of climate change, provide energy security by facilitating processes to store fuel, and help build a carbon economy by significantly reducing energy costs worldwide. Read more here.